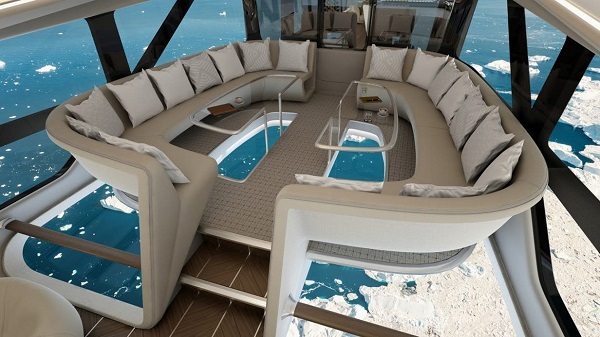 Bedfordshire-based Hybrid Air Vehicles (HAV) and Design Q last week unveiled the passenger cabin for the Airlander 10 airship with facilities including a viewing lounge with floor-to-ceiling windows and a glass floor (see below). Nervous types probably should not apply, but there will be a bit of a wait yet – the “Flying Bum” as it's been called because of its shape, has to complete 200hr of test flying before it can enter service. Meanwhile, we’ll just have to sit and dream. More pictures and videos are on the HAV website. "New Gas USA Barry" ....literally, 'New Gas'....no World War 1 spiked helmets or World War 2 era Radio Masts! This looks like a great idea, if with only limited opportunities for service. No seatbelts!? A bit curious. It reminds one a bit of the upper deck on 747s which were first thought of, it seems to me, as special dining places for 1st-class pax. The last passenger flight of this type of aircraft didn't go so well if I read my history books correctly.